Sometimes a cat that no one knows gets stuck in a tree, and it is the property owner, concerned neighbor or passer-by who calls me to rescue it. These unknown cats could be feral and mean or tame and super-sweet, but I won't know for sure until I get in the tree with them. So far, I have been very lucky in that most of these unknown cats have been very sweet and cooperative. 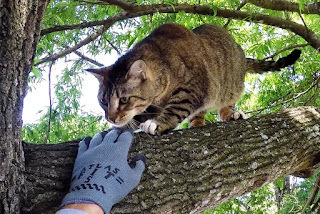 When I got the call from Tim, a conscientious and concerned homeowner who found an unknown cat in his tree, I wondered if my luck would continue to hold. Tim told me that the cat had been stuck in the tree on the edge of his yard for two nights. The second night, we had some of the most horrendous weather. There were severe storms, perpetual lightning, flash flooding and tornado watches in the area most of the night. This poor cat suffered through the entire storm, and when Tim checked on him the following morning, he found him still there looking pretty soaked and ragged. Tim told me that there was a possibility that the cat belonged to a neighbor whose home had flooded during the great flood of August last year. The house was still not ready for the neighbor to move back in, but the cat was still living there. Tim was having some trouble reaching the neighbor to ask, and he still had not been able to contact them when I arrived for the rescue. 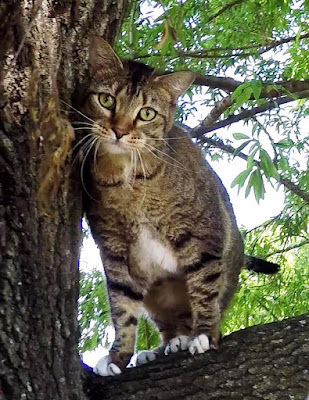 The cat, which I will call Bruiser because of his large size, was a gray and brown tabby, and he was only 15 feet high on the first branch of a very large oak tree. When I arrived, he was silent and watched me with a fearful look on his face. After I spoke to him for a few minutes, he eventually responded with a fairly relaxed meow. That was a good sign, but he still looked a bit nervous to me. There was plenty of tree for him to climb if he was fearful of me, so I decided to plan for that and set my rope about 50 feet high in the tree. While I prepared to climb the tree, there were times when he appeared frightened and other times he seemed relaxed. I climbed up to him slowly while watching his reaction carefully. He seemed perfectly fine now and remained in place while he watched me approach. He was relaxed, and when I reached out my hand to him, he sniffed it. Then he let me touch him. I stroked his back and rubbed his head and cheeks, and he enjoyed it. 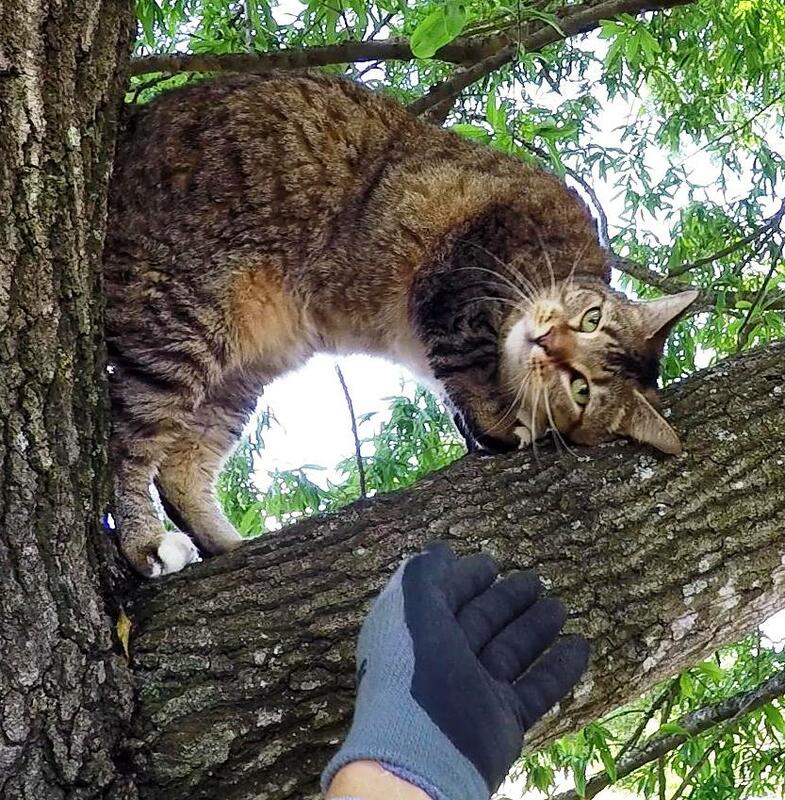 We both relaxed as we built a friendly relationship there in the tree. After introductions, I opened a can of food, and he was immediately interested. He took a bite and was ready for more. I put the food in the back of the carrier to see if he would walk inside. He was hesitant to go inside, but comfortable with the carrier. He rubbed his head on the outside of the entrance to the carrier, but he did not go in. I pulled the food out and gave him another bite. I made sure that he watched as I put the food back inside the carrier. When I held the carrier up to him the second time, he looked inside, thought about it for a few seconds and then walked on in. As I closed the door, I was surprised at how heavy this big boy was. When I brought him down, Tim took him over to another neighbor to see if she could identify the cat. She recognized it as the one that belonged to the flooded neighbor. Eventually, Tim was able to contact the cat owner, and she planned to be there later in the afternoon to get her cat. 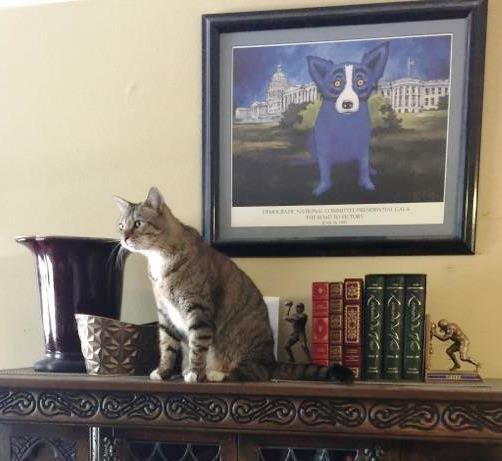 In the meantime, Tim released the cat in his house and planned to hold him there until the owner could get there, and it was during that time that he took this picture. They were reunited later that afternoon, and both are very happy to be back together again. I was unable to get any more information about the owner or the cat, so I still do not know the cat's name. Regardless, the cat is down and safe now, and my good luck with unknown cats continues.